One $2,000 Grand Prize Treasure. Participants have opportunities to solve clues throughout the 10-day period to help them learn more about this mysterious treasure and its location. One $500 “Top Points Earner” treasure is awarded to one of the Top 10 highest Points earners. Many smaller treasures valued at $100 each make up smaller hunts hosted throughout the event. Treasure Tokens are hidden with each hunt corresponding to each chapter. In general one Treasure Token per day is hidden and can be redeemed for its corresponding prize valued at approximately $100. 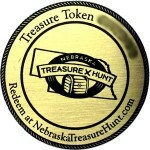 The Grand Prize Treasure Token is a large, special token worth $2,000 cash. Up to 50 additional Bonus Tokens will be hidden. 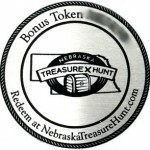 They can be redeemed for Nebraska Treasure Hunt Points by clicking on the Rewards button in your Kearney App and then clicking on Earn Points and the link to redeem Nebraska Treasure Hunt tokens. Enter the code found on the token. It can only be redeemed one time. To redeem a Treasure Token, fill out the form below and we will make arrangements with you after proper verification. Each Treasure Token can only be redeemed one time. Hiding places that are similar to where you might find a geocache. In or very near Kearney. A museum or public building, but nowhere that would require entry fees or that could lead to damage or removal of property. Private property unless explicitly stated otherwise when the hunt is published. In that case, the location of the private property will clearly be stated; no guessing is necessary. Buried in the ground, although they may be lightly covered and hidden with vegetation or other similar masking materials, similar to how you might expect to find a geocache. Places that require special skill, equipment, risk, or that pose the potential to damage property. This includes, but is not limited to high up in a tree or on a structure, on the side of a cliff or dangerously close to running water, in water, the middle of the street, on an island (darn! ), inside a wall, under a heavy boulder, in the middle of a manicured flower bed that could be damaged by foot traffic, other similar places. Don’t waste your time looking here. Use common sense and be mindful of property, safety, and others. Gold tokens are redeemable for prizes. To redeem a gold token fill out the form on this page. Silver tokens are redeemable for points in the Kearney App. There’s no need to fill out the form to redeem these, it can all be done in the rewards section of the Kearney App.